In 1919 there was found on the shore of Christian Island in Georgian Bay a relic of the Jesuit mission to Huronia, which has aroused much curious speculation. It is a small cannon of bronze and iron of unusual construction & date. In common with all others interested in the history of Huronia, I searched the Jesuit relations and other contemporary documents for some reference which might contain information and give some explanation of this curious piece of artillery. I found nothing in these or in secondary sources beyond some conjectures as to who sent it out to Canada and vague interpretations of a few words inscribed upon it. Thus it remained, like so many other minor facts of our past, surrounded with an attractive (fascinating) atmosphere of mystery. I know not whether other student of history, amateur or professional, are afflicted with a similar habit of mind as myself, but I find such trivial things exacting a degree of attention out of all proportion to their historic significance and abiding themselves at times when I should be concentrating upon more serious importance. It is in vain that I brush aside these interruptions. They are, as it were, mental mosquitoes continually buzzing about one's thoughts. I suspect that the persistence of this habit classes one an antiquarian rather than historian. Such at any rate was the effect upon me of the cloud of uncertainty and ignorance which obscured the old cannon since I first saw it. There it was, visible, tangible with not a single documentary statement to tack on to it. But, what research fails to discover, accident occasionally reveals. Some time ago, looking through Rev. J. B. A. Ferland's "Notes sur les Registres de Notre Dame de Quebec", which contain not only purely parochial, but have frequent items of general news, I came upon the following under date of August 6th, 1648. French. "Left 3 River 50 or 60 Huron canoes in which were embarked 25 Frenchmen, 5 Jesuit Fathers, 1 Brother, 3 young men or boys, 9 workers and 8 soldiers, besides 4 which were to be taken on at Montreal, 1 heifer, and a small piece of cannon." In all probability that found on Christian Island. Thus on that August day, we have a brief glimpse of it before it vanishes into the northern wilderness. One can follow it in imagination up the rivers; over the portages, certain that it gave less trouble than it's traveling companion, the heifer, who, if she was a typical cow, must have often led the good fathers a merry dance. This piece of information from an unexpected source naturally suggested a consultations of Father Jones "Old Huronia". There in the section devoted to missionaries - missions year by year, I found on pp. 375-76 the record of the arrival of the party at Fort Ste. Marie. Omitting the authorities cited it reads as follows: "In the beginning of September 1648 F. Bressani returned from Quebec with 4 new missionaries, FF. Gabriel Lalemant, Jacques Bonin, Adam Greslon, Adrien Daran, and a lay brother, Nicolas Noirclair, "Petit Louis," aged 16, afterwards known on the missions as "Bro. Louis La Boesme. Leaving Quebec July 24, 1648, the whole Indian flotilla consisting of 50 or 60 canoes, finally set out for the west from Three River on Aug 6th. Besides those mentioned there were 26 Frenchmen, 2 boys, 9 laborers and 8 soldiers and 4 more of the latter were picked up at Montreal". There is no mention of the heifer or the cannon, but there can be no doubt that the cannon at any rate, reached Ste. Marie safely. Thus from these two sources emerge a few minor facts about it - the date of it's leaving Three River on Aug 6th and the approximate date of its arrival, the beginning of September and the short time that it was in the Jesuit forts at Ste. Marie I from early September 1648 to the departure for Christian Island. And at Ste. 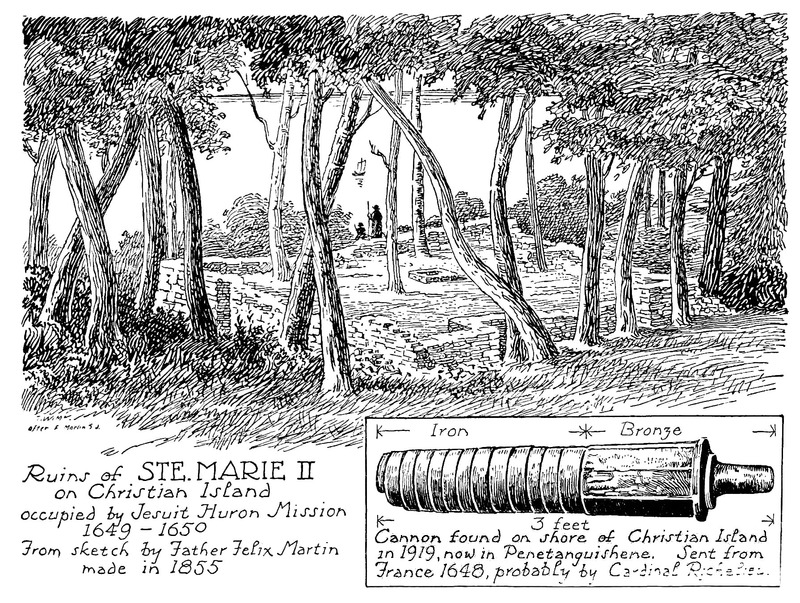 Marie II till the final abandonment of the Huron mission when apparently the cannon was left behind. Thus too is rendered improbable the suggestion that its donor was Richelieu, his death having taken place in 1642, six years before it came to St. Marie.